​Sneha Sagar Society (SSS) is a Mumbai-based non-profit, managed by Catholic Sisters. This is a secular organisation and works with the orphans and abondoned children residing in the slums of Mumbai. SSS runs shelter homes and orphanages for the destitute and provides emotional, educational and medical support along with basic facilities like food and clothing to all children staying at SSS’s premises. Although, SSS’s focus is to care for children, they also have introduced vocational training sessions to empower women. For abondoned senior citizens, SSS runs two old age homes. SSS offered after school support to roughly 30-50 children at SSS’s Ghansoli’s community center (rented premises) during FY13. Orphanage at Malwani (rented premises) accomodates 16 children, both boys and girls between the ages of 1 and 14 years. These are children of parents who have been afflicted by HIV or TB. Another orphanage in Vasai (owned premises) provides care to 25 children. These are children from Mumbai and Thane districts. Educational, medical and nutritional support is provided to all at the center. Besides this, regular extra-cirricular activities are conducted to boost every child’s confidence and groom their personality. Until April 2013, SSS ran vocational training sessison on tailoring, art and craft and on other fields to empower women in Vasai (rented premises). 24 young girls were trained between 2010-2013. Due to lack of funds, SSS had to shut down this centre. At its two old age homes, one at Mira Road (owned) and other at Naigaon (owned), SSS houses 24 elderly destitute women. These women are above 75 years and come from different castes. Nutrition, shelter, medication and entertainment is provided at both the homes. SSS also reaches out to the children of the tribals in Wadda, a town in Thane district. The Sisters conduct coaching classes and provide basic medical services. 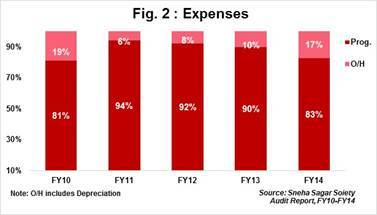 SSS’s income continued to decline and fell by a further by 41% YoY in FY14, (from Rs4.5mn in FY13 to Rs2.6mn in FY14. The drop in income was owing to decline in donations received from individual donors. As no income break-up was shared with us, it is difficult to assess the income received from foreign v/s local sources for the period FY10-FY14. The sources we interacted with during our visit to SSS indicated that despite Sisters running the organisation, they receive no funding from any church. However, during festive season, SSS is allowed to put up a stall outside church and sell hand made products. Income earned through sales forms a very small portion (undisclosed) of SSS’s total income. With declining income, the proportion of funds spent on beneficiaries also reduced by 8% YoY in FY14, i.e. 90% in FY13 to 83% in FY14. The decline was due to reduction in staff cost and direct program cost. SSS’s 5-year average spend on beneficiaries was 87.5% which is above the average industry spend during FY10-FY14. 91% of total fixed assets as on FY14 includes three owned properties; viz. orphanages & shelter homes in Vasai, Mira Road and Naigaon. All three properties, collectively were valued at Rs11mn at the end of FY14. SSS’s 5-year income CAGR for the period FY10-FY13 stood at 5%. 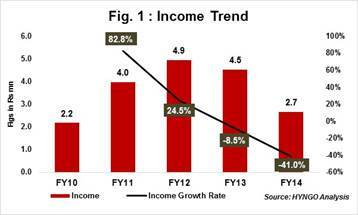 The YoY decline of 41% in FY14 dragged down the income CAGR for the same period. Fund raising. To overcome this challenge, SSS had considered registering with online fund raising portals. However, despite going through the arduous listing process with a couple of fund raising agencies few years ago, unfortunately SSS has received no funding through this channel yet. Skilled staff. Other than the Sisters, there are no members in the team who are well versed with donor relationship management and marketing/promotional activities. SSS is actively looking to induct someone who could position SSS’s activities better. The Board is comprised of nine Sisters and each of them are responsible to head each center of SSS. No Sisters are related to each other. SSS has follows a board rotation policy and after every five years, altleast three new members are inducted on the Board. All Sisters stay in one apartment (taken on rent) which gives them enough time to discuss the challenges faced and available opportunities with each center. However, they all meet formally once in a month to review SSS’s performance. Minutes of the meetings are documented and circulated to all donors on a bi-annual basis.